Sound supervisor and Golden Reel award winner Erich Gann (Genius, Star Trek, Wrecked, Agent X, Silent Witness, Battlestar Galactica and Empire) talks about how he uses the full range of Synchro Arts software - VocALign, Revoice Pro and Titan when editing dialog, ADR, music and sound effects. Erich Gann began his career in 1996 as a music educator. After a brief stint as a session musician, he soon fell in love with studio work and went to recording school, before moving to Los Angeles in 1998 and landing a job in post-production at LA’s Technicolor Sound, editing dialog, music and sound effects for reality and non-union projects. In 2005, he joined the Smart Post Sound family in Burbank, cutting sound effects and sound design. That led to more senior sound supervision work and since then, Erich has worked on a number of high-profile film and tv projects including Genius, Wrecked, Agent X, Silent Witness, Battlestar Galactica, Empire, Six Feet Under, Mayans, Beaches, Sons Of Anarchy, Heroes and The Orville and many more. He’s also been nominated for two Primetime Emmies, three Golden Reel awards and won an MPSE Golden Reel award in 2014 for Kurt Sutter's “Sons of Anarchy” which aired on FX Networks. 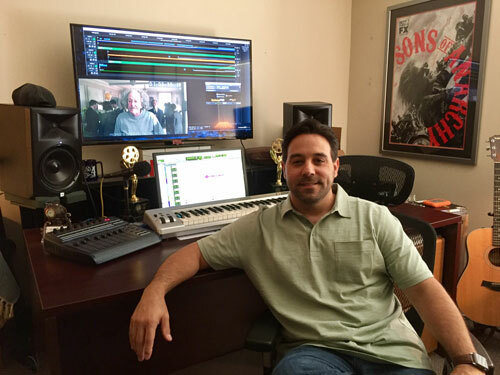 Erich believes it’s important for all sound editors to be able to cut dialog, ADR, music and sound effects and that philosophy has made him more aware and effective as a post production sound supervisor. However, there are always hurdles to overcome. "One of the biggest challenges for a modern day ADR editor and sound supervisor in television is production sound quality. Due to better technology and smaller budgets, filming moves faster than ever before. In turn, production sound mixers are not given adequate time to prep and record the best sound possible. The quote "we'll fix it in post" has become less of a passive aggressive joke and truly a reality. However, with some of the modern advancements and capabilities of plug-in technology, we're becoming more and more dependent on them to fix our sound problems. Erich's also known for his work on the now legendary Star Trek series. “I was just beginning my career on the last run of the Enterprise series which laid the foundation for my work ethic, including the way I deal with my team and clients. Although I was the youngest on the crew, they made me feel like I was part of their family. I was always proud to be working on the series and looked forward to top-notch music, sound and people! Years later, I’ve had the pleasure of having some of the old crew come and work for me. Sharing some interesting insights into his set-up and dialog editing workflow, this includes Synchro Arts’ Titan. "I cut in ProTools on an Apple Mac Mini with a boat-load of RAM. Because Pro Tools is completely native these days, I don't really need a full system with lots of I/O like I used to have. Typically, I use Izotope's RX6 Advanced, Revoice Pro and VocALign for dialog and ADR editing. Simple, elegant and get's the job done. My typical workflow begins with our assistant's putting the sound dailies together into a Pro Tools session using Titan. This program is essential because it aligns all the corresponding sound rolls and takes to a final locked version of the picture. Once the assistant's have run a Titan pass for me, I add a few tracks to the Titan Pro Tools session and begin to pick and choose the best mics for each scene. Having the Titan assembly allows me to audition all available mics and determine whether or not to we need to look for an alternate take or to ADR a particular line of dialog. " But when it comes to the tricky task of dialog alignment and editing ADR, Erich always uses Revoice Pro. "Many times I'm able to find an alternate take that is almost identical but might need a little adjusting. That's where Revoice Pro can help with tightening the sync and possibly matching the inflection from the original line of dialog. Once I've made those decisions, I begin to go back and cut all the dialog for the episode or movie. Any ADR need will be flagged and I'll then go back and cue the lines for an upcoming ADR session." While working on Genius, Revoice Pro played a big role in getting Erich's ADR ready for each dub. "My favourite process has to be the ability to take the vocal inflection from a line of dialog and graph that inflection onto an ADR line. I dealt with lots of European accents throughout the series and dialect inflection was a struggle for the actors when shooting ADR. However, using Revoice Pro I was able to manipulate some of it to correct enunciation inflection. Really cool! "I dealt with lots of European accents on that film and dialect inflection was a struggle for the actors when shooting ADR. However, using Revoice Pro I was able to manipulate some of it to correct enunciation inflection." Finally, he passes on some valuable advice to audio professionals just starting out in post production. "Be patient, humble and always maintain relationships with the people you work with throughout your career. This business is very close knit and you will always end up working with people from your past, above and below the line." Find out more about Smart Post Sound here. For a free, 14 day trial and more information on getting the best from using Revoice Pro, click this link and select your DAW.